Part of the reason for the trip north was to travel in the cab of a diesel High Speed Train from Edinburgh to Inverness. This was organised by East Coast and I don’t think they’d be too happy, if you used this page as an excuse to try to do the same. But thanks to everyone at the company, for giving me the trip of a lifetime! I travelled with their Driver Manager, who himself had spent years driving trains, and an experienced driver from Newcastle, so if anybody thinks that having me in the cab compromised anything, then there was no way I could. The first thing that struck me about the journey was how quiet it was in the cab of the HST, despite having a 2,250 horse power diesel engine in the next room. Compare this with the engine in a typical heavy truck and it’s about five times as powerful, but then it has to pull nine full coaches, with the help of the other power car at the back of the train and a total of 4,500 horses. Compare it too with the 3,300 horse power of the Deltic of the 160s and 1970s. But that was a 100 mph train, as opposed to the 125 mph of the HST. It should also be said that the noise and vibration was much less than that I experienced as a passenger on one of the dreaded Pacers on my way to Scunthorpe. Before you watch the video, note that the occasional screeches are the signal warnings, which must be cancelled by the driver. As they say, enjoy the film! The video has now been shortened, by cutting out some of the repetitive bits! Incidentally, my typing and vision has improved a bit, since the trip. Was that improvement caused by travelling in a HST? If it is, then it’s a very unusual cure and something you won’t get on the NHS! To say the least it was a train journey of a lifetime, usually at 90 mph on a line that rises to 1,400 feet above sea level. How many trains in the world do that sort of speed on a line that was opened in the last century. Remember too, that the youngest HST is 27 years old! Some journey! Some train! But then good engineering is absolutely timeless! Some of my friends, think that I didn’t take this film. So here’s a picture of me in the cab. I actually didn’t realise I looked that scruffy, but then I was travelling to be warm! 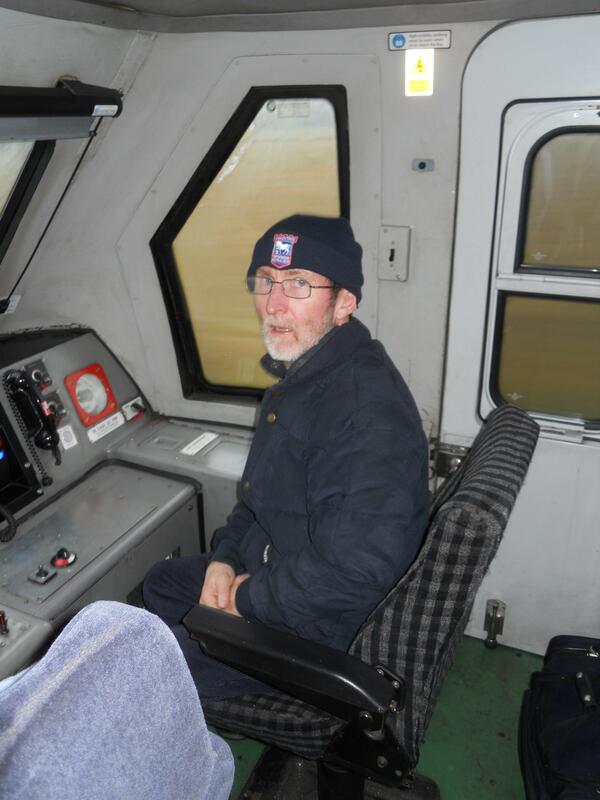 Hence the Ipswich Town woolly hat! Was it the first time, such a hat had been worn on an HST? Glad you like the post and the trip! er enkel å installere, og du trenger ikke en profesjonell installer eller tekniker for å gjøre dette. Thanks! But I don’t need the money at the moment. If I did it, I’d do it for charity! Probably to fund PhDs students doing worthwhile research.